We’re the premier Live butterfly release company to buy from for releasing Painted Lady butterflies for a Memorial Butterfly Release and a Butterfly Release Funeral. If you’re looking to purchase a butterfly release for a memorial service, our Memorial Butterfly Release Package of 40 Painted Lady Butterflies in Butterfly Shaped Mass Release Box is one of the best you can buy. We love helping people have an exceptional butterfly release memorial service with our products. Though similar to a funeral, a memorial service is a different way to honor the life of a departed loved one. The main difference is that the body is not present at a memorial service. The service can also be held at any time, be it a week after death or any amount of years after the death of a loved one. No matter when you hold a memorial, purchasing this Memorial Butterfly Release Package of 40 Painted Lady Butterflies in Butterfly Shaped Mass Release Box for your memorial service, is a wonderful way to celebrate the life that has passed. View a Live Butterfly Release at a Memorial in the video below. A memorial service is a service that memorializes one who has passed. The service often takes place after the body has been cremated or laid to rest. There is no set time for a memorial service to take place. It can be a week, a month or even years after death. The important thing is that you, as well as family and friends of your loved one, are gathering to remember and celebrate the life that the deceased had lived. View a Memorial Butterfly Release For Jake in the video below. Memorial services are informal events, and can be held just about anywhere, though most like to choose a location that meant something to the deceased. A city, a park, a beach, or even a restaurant that the deceased loved are all perfect places. Or you can choose to host the service at a place that can accommodate a large group of people, such as an event hall. There is no particular protocol to follow when you have a memorial service. You can structure it any way you want. You can have readings or prayers, or you can have friends and family share stories about the deceased. It is also common practice to have a reception afterward, where you can continue to share stories of the loved one while everyone eats and socializes together. What Makes a Memorial Service Different from a Funeral? There are a few differences between a memorial service and a funeral service. One difference is that a funeral is a more formal, structured event. A funeral service takes place usually at a funeral home or a church (sometimes both). After the formal service is over, a procession is made to the burial site if the body is to be buried as opposed to cremated. View a Live Butterfly Release For Funeral in the video below. The big difference between a funeral service and a memorial service is that the body of the deceased, or his or her ashes, are present during a funeral. If the body is to be buried, it is prepared by a funeral home; made ready for viewing. Having the body present for some is beneficial. It gives friends and family one last chance to say goodbye. For many it provides a form of closure. A memorial service, as opposed to a funeral service, takes place after the body has already been buried. If the deceased has been cremated, many use this opportunity to scatter the ashes. Usually photographs are often displayed in place of the body of the loved one. No matter what your choices are for this event, memorial services are typically more simple and usually more economical for for many. Some people feel that spirituality is often sacrificed due to the costs of a funeral, and therefore a memorial service allows a better way to honor the dead. There are two options for a memorial butterfly release when releasing butterflies. You can do a mass butterfly release with our memorial butterflies, where you release several butterflies from a single box (usually decorative), or you can opt for an individual butterfly release. With the individual butterfly release, your guests are each given an envelope, usually featuring an inscription of the deceased's name, containing just one Painted Lady Butterfly. You can then choose to have your guests release the butterflies all at once, or you can let them release them one at a time. View an example of opening a delivered butterfly release product in the video below. When you order your butterflies from us here at Cloverlawn Butterflies, they are shipped, with few exceptions, to arrive the day before your memorial service. When shipped, your Painted Lady Butterflies are sent in a box containing an ice pack. This is to keep them dormant. It is recommended that you change the ice pack when you receive your box in order to keep them in this state. Do not put them in the refrigerator or freezer. On the day of your memorial service, you should give your Painted Lady butterflies approximately a half an hour to warm up and wake up. For an individual butterfly release, distribute envelopes as close to the release time as possible. Inform your guests that there is a butterfly inside, and to handle the envelope with care. If everyone is releasing together, provide a signal, such as at the end of reading a poem, to let them know it is time to release them. There are a few things to keep in mind when releasing your Painted Lady butterflies. First, make sure that you and your guests release them outside. They should be freed during daylight hours. The temperature should be warmer than 65 degrees, but cooler than 80. It should also be on a day that is absent of rain and heavy winds. With all of this in mind, you should have a successful, beautiful and moving Painted Lady butterfly release that allows you to honor the memory of your loved one and send their spirit on to where it needs to go next. When you lose someone that you love, it is indeed a sad time. But in your mourning, it is also important to celebrate the life that he or she lived. A memorial service is the perfect way to honor that person. And releasing butterflies during that service is the perfect way to let family and friends know that the soul still lives; your loved one has simply transformed into their next stage. Celebrate and honor the life of your loved one and release butterflies at the memorial service of your departed loved one. Cloverlawn Butterflies Butterfly Release Company provides Painted Lady Butterfly Release packages perfect to fly and flutter at any of your events or special occasions. This Live Memorial Butterfly Release Package of 40 Painted Lady Butterflies in Butterfly Shaped Mass Release Box will leave unforgettable memories to all who participate in or attend a memorial service. The process of buying our Live Memorial Butterfly Release product is safe and easy when you purchase from Butterfly Release Company Cloverlawn Butterflies. 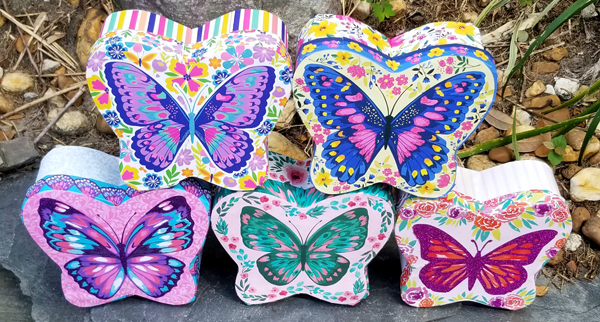 First you choose your Memorial Butterfly Release Package of 40 Painted Lady Butterflies in Butterfly Shaped Mass Release Box that will contain your butterflies to release. Next you choose your “Butterfly Release Date.” This lets us know when your Live Memorial Butterfly Release will take place as your butterflies will arrive the day before your Butterfly Release Date. Next you choose the quantity amount of each set of Memorial Butterfly Release Package of 40 Painted Lady Butterflies in Butterfly Shaped Mass Release Box for release you want to buy and then add to cart.